Just prior to World War II, the USA started building a class of fast attack boat called PT boats. These were roughly similar, but there were many different designs. A total of 812 were built. PT stood for Patrol Torpedo. On 23 August 1941 at the Electric Launch Company Ltd. (Elco), Bayonne, New Jersey, USA, the keel of PT 67 was laid down. It was of the ELCO 77' or PT 20 class (of which 49 were built). These boats were 23.1 metres (77 feet) long, 6 metres wide and had a draft of 1.65 metres. They displaced 35 tons. Each boat had three 1,200 hp Packard liquid cooled engines, each driving a propellor. Top speed was between 39 and 42 knots. The hulls of these boats were made of plywood. The boats were crewed by 10 men and had one 20 mm gun, two twin barrelled 50 calibre machine guns and two (some sorces say four) 21" torpedo tubes. PT 67 was launched on 8 November 1941. It was completed on 17 January 1942. On 22 April 1942 at the Electric Launch Company Ltd. (Elco), Bayonne, New Jersey, USA, the keel of PT 119 was laid down. It was of the ELCO 80' class. These boats were 24 metres (80 feet) long (not sure about width, probably 6 metres). The boats displaced 51 tons. Each boat had three 1,350 hp engines, each driving a propellor. Top speed was between 43 knots. The hulls of these boats were made of plywood. The boats were crewed by 11 men and had two 20 mm gun, two twin barrelled 50 calibre machine guns and four 21" torpedo tubes. PT 119 was launched on 21 July 1942. It was completed on 8 August 1942. On 2 December 1942 PT 119 was in Noumea, New Caledonia. I do not know how it got there, but from I have read, I have deduced that it was carried as cargo on a larger ship. PT 119 was part of squadron 6 of Division 17. There were four boats of Squadron 6 here, PT 119, 120, 113 and 114. PTs 121 and 122 had left a few days earlier. On 3 December 1942 USS Hilo set out towing two of the PT boats and the other two went under their own power. They were headed to Cairns in Queensland, Australia. They travelled at five knots and were escorted by USS Aaron Ward. Click here to read about the Aaron Ward which was later sunk in the Solomon Islands. None of the PT boat crews had been to sea before and they had poor conditions. The inexperienced crew had trouble keeping in formation with the tow boat. It took just over seven days to get to Cairns and they arrived there in the morning of 11 December 1942. Late on the afternoon of 15 December 1942 the Hilo and the four PT boats headed off to Milne Bay in New Guinea. The PT boats were all under their own power and they refulled from the Hilo the next day. They were escorted by USS Patterson. On the morning of 17 December 1942 they sighted the New Guinea coast. Here the Patterson left them and returned to Cairns. As the frontline had moved up the New Guinea coast, the PT boats appear to have left Milne Bay just before Christmas 1942 and set up base at Tufi. This is now part of Papua New Guinea. Tufi is at the end of Cape Nelson, 250 kilometres east north-east of Port Moresby on the northern coast, roughly half way between Lae and Alotau. On the night of 3 January 1943, all 10 PT boats now in the area set out on a mission to attempt to destroy the remains of the Japanese fleet that had been attacked the previous day by over 100 US and Australian aircraft. PT 119 hit a submerged object and had to return to Tufi. PT 119 was now under the command of Ensign R. L. Jackson, USNR. PT 67 was also part of the 10 boats sent out. It was under the command of Ensign James W. Emmons, USNR. The Oigawa Maru was sighted and some of the PT boats fired torpedoes. The Oigawa Maru was already badly damaged and it was sent to the bottom. 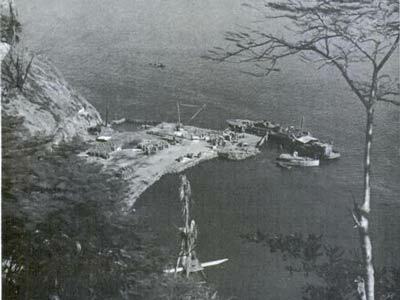 Late in the afternoon of 17 March 1943, PT 119 and PT 67 were refuelled at Tufi wharf. Refuelling was down from 44 gallon (200 litre) drums. After the boats were refuelled, a sheet of flame shot up between the two boats. I have read that when the refulling was going on, the person refuelling realised at one stage that one drum was low octane (compared to the high octane required) so he put the nozzle over the side of the boat and some fuel was spilt on the water before its flow could be stopped. It is then said that a native lit a cigarette and threw his match in the water, igniting the fuel. The two boats were immediately engulfed in flames, the crew barely having time to jump overboard. A small Australian cargo ship, the AS16 was also caught up in the fire. As could be imagined, the wharf area had lots of fuel and ammunition. The fire burnt till late on 18 March 1943. Losses were the two PT boats, the Australian ship, 4000 drums of fuel, six depth charges, ammunition, the wharf, sheds, spare parts and tools. No lives were lost and no-one was injured. As indicated above, Tufi has a wharf. This wharf has obviously been rebuilt since March 1943. The original one was held by the Japanese and was the site of the PT boat station. Off the wharf there is a large amount of wreckage and debris, including the remains of the two PT boats. One is clearly seen with its three large engines, torpedo, gun and depth charges visible. It is reported that the wreck of the AS16 is also visible but deeper. However, I did not see this on my dive here. As well as these items, there is a large concrete boat, empty 200 litre drums and anti-tank barriers. A very interesting dive of almost 50 metres just a short swim from the wharf.